Pro-life activists march towards the U.S. Supreme Court, during the March for Life in Washington, Friday, Jan. 18, 2019. WASHINGTON, D.C. — “Happy March for Life!” More than a few people said that to me as I arrived here for the annual pro-life rally in our nation’s capital. The march actually consists of a few days of events. Initially a protest of the Supreme Court decision that legalized abortion, the march has evolved into more than just a protest. It’s a celebration as well — a reaffirmation of the things that really matter in life. 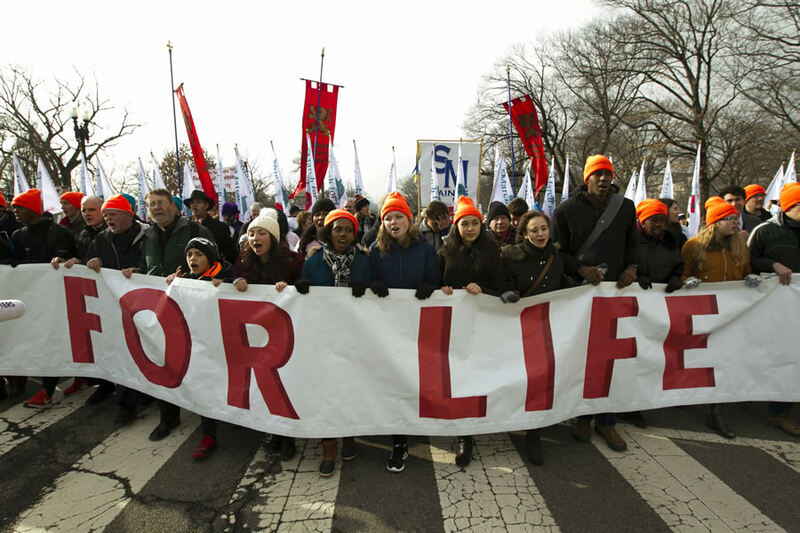 So why would the March for Life be a happy celebration? Because, in no small part, of the kids. The young people in attendance — a vast majority of them high school and college students — bring an energy and a rejuvenating commitment that, frankly, is needed more than ever in our country right now. It happens without fail every year: I walk into, usually, St. Matthew’s Cathedral, not very far from the White House, on the morning before the march. I forget that this is going to be a full 8 a.m. weekday Mass and smile as I see the high school students getting off their buses. The vast majority of them this year appeared to be from Baton Rouge, Louisiana. And after Mass, a woman I talked to said how familiar I looked. Perhaps her local paper runs this column or maybe she remembered the happy lady posting photos on social media of the students and the religious sisters traveling with them from the year before. Helen Alvare, a law professor at the Antonin Scalia Law School in Virginia, often talks about the collective female misery brought about by abortion. The pressure on the poor and minorities to resort to abortion is something that should be a matter of outrage — but so should the pressure on working women. The upcoming movie Unplanned, about Abby Johnson, a Texas Planned Parenthood director who became a pro-life activist, illustrates the kind of corporate mindset that would keep women from fully embracing life. This mindset has infected our whole society, affecting families, the economy, religious life, crime and punishment, you name it. But as with the recent Fellowship of Catholic University Students SEEK event in Indianapolis at the start of the new year, this was a little window into the future. We prayed for victims of abuse and all of the 10,000 people at the Mass that night, and I walked away with a sense that these kids reject the poisons. One of the last things I saw before I left the Catholic University of America’s campus was a snowball fight outside the church. It wasn’t vicious, but playfully tender. There’s a light hand to this generation, because they have seen the harsh and callous attitudes and sins that have destroyed lives and hearts. In the wake of such grim revelations and in the face of such a toxic cultural moment, they are a breeze that helps us move onward. May it be a breeze that lifts us all into a better future.